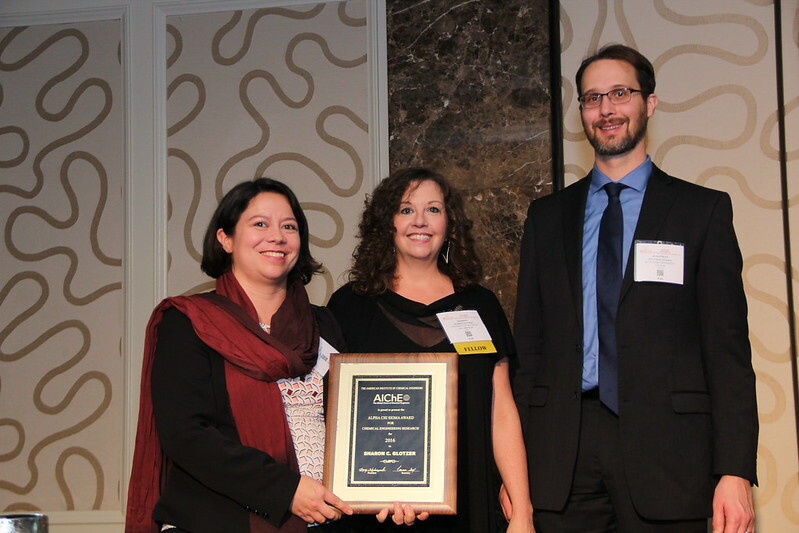 The 2016 Institute and Board of Directors' Award winners were given at the Honors Ceremony at the Annual Meeting in San Francisco. 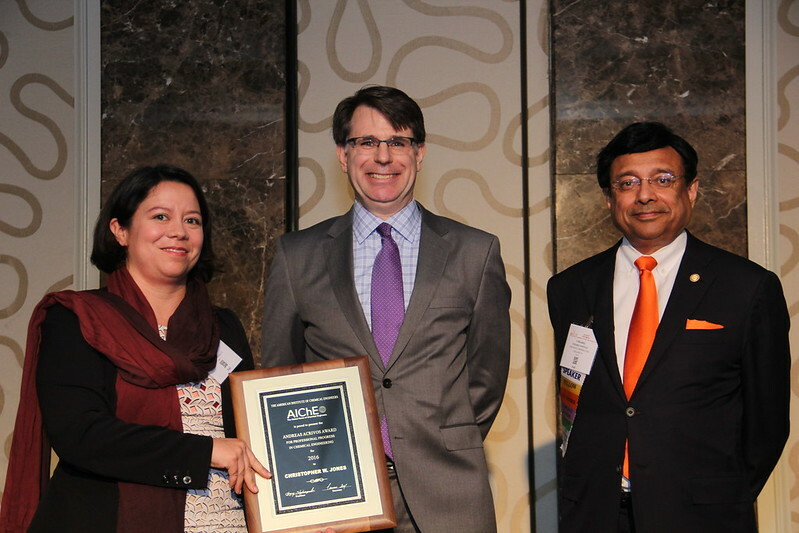 These are AIChE's most prestigious awards, honoring eminent chemical engineers for career accomplishments, service to society, and service to the Institute. Current president Greg Stephanopoulos presented the Board of Director Awards. 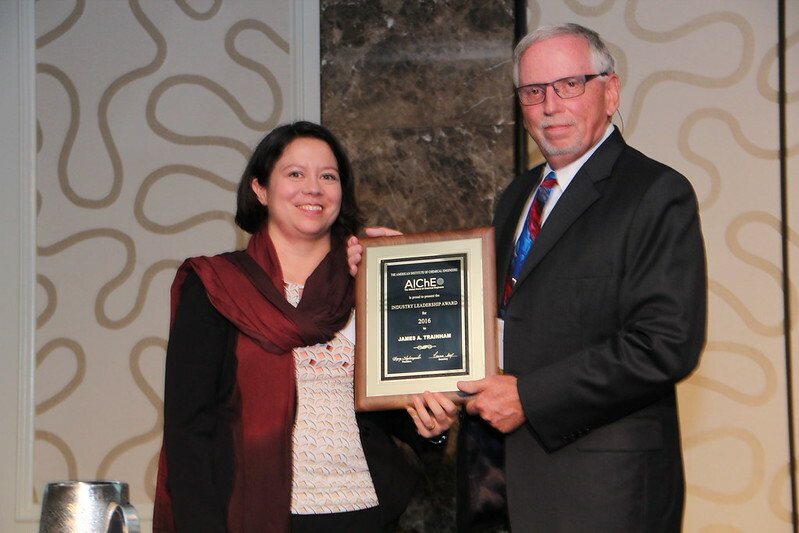 He recognized that throughout this week, AIChE will also celebrate other distinguished contributors through our division, forum, and committee awards. See all awards presented at the Annual Meeting. 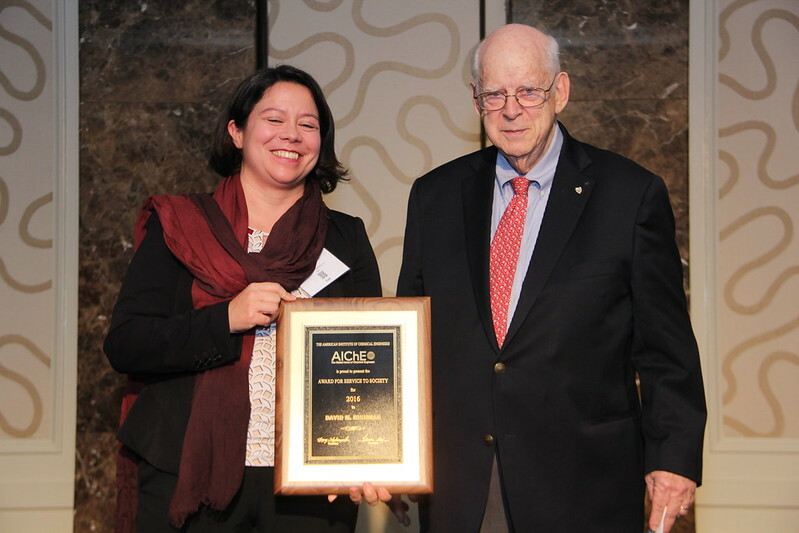 The Founders Award is presented to engineers who have had a profound impact on the way that chemical engineering is practiced, and whose achievements have advanced the profession in any of its aspects. This year's Founders Award recipient is Dr. Klavs F. Jensen, an AIChE Fellow and the Warren K. Lewis Professor of Chemical Engineering at the Massachusetts Institute of Technology. "For pioneering contributions to fundamental research, industrial practice, and education in advanced manufacturing technologies, and international intellectual-professional leadership in academic administration and strategic R&D." Learn more about this award. Learn more about Klavs Jensen. 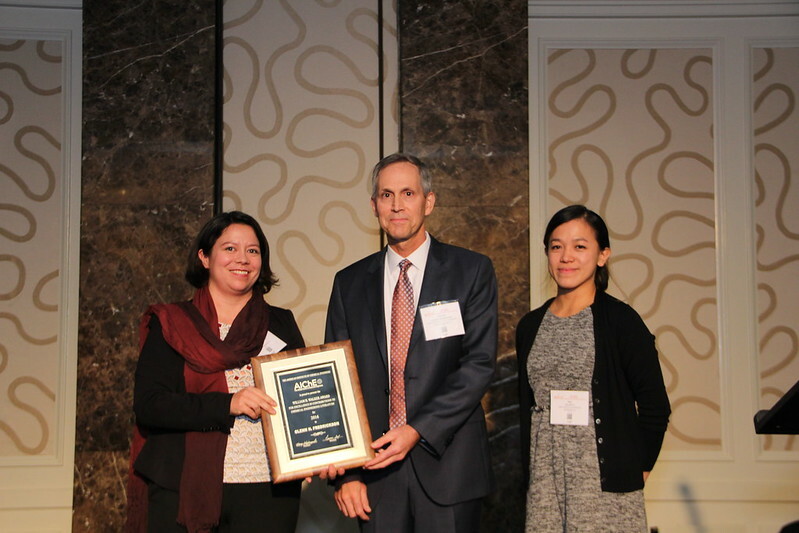 This award, sponsored by The Dow Chemical Company, is presented to David R. Eckhardt, an AIChE Fellow and project manager at Irwin Engineers in Natick, Massachusetts. Learn more about this award. Learn more about David Eckhardt. Before moving on to the Institute Awards, Greg recognized the newly named John M. Prausnitz AIChE Institute Lecture and this year's lecturer. For 68 years, the Executive Board of the Program Committee has invited an AIChE member to present a comprehensive overview of chemical engineering in his or her area of specialization. 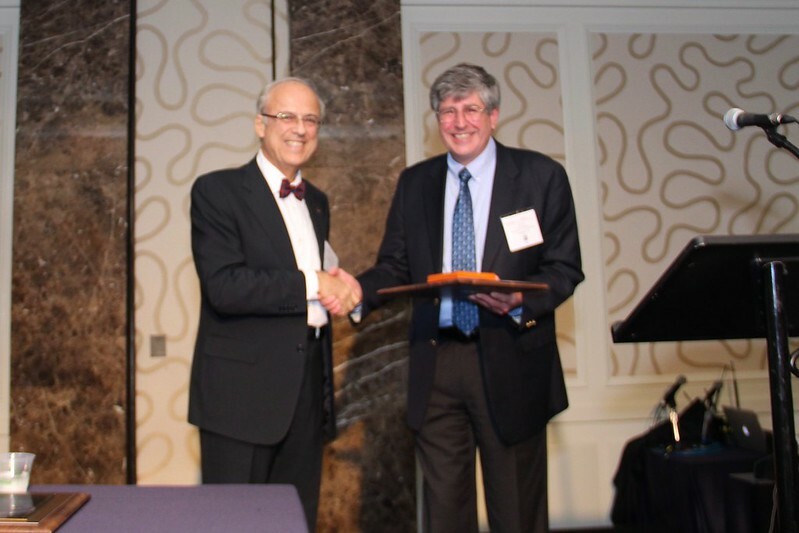 In 2016, this high honor has been endowed, through generous donations to the AIChE Foundation, in the name of our colleague John Prausnitz of UC, Berkeley. He explained that at this meeting, we’ll be inaugurating our John M. Prausnitz AIChE Institute Lecture, which will be presented by Doros Theodorou, Professor of Chemical Engineering at the National Technical University of Athens. Dr. Theodorou will deliver his lecture entitled “Molecular Modeling of Materials: A Chemical Engineering Perspective” on Wednesday at 11:15 AM, in Grand Ballroom A of the Hilton. He will be honored formally at the end of his lecture. You can learn more about the endowment here. 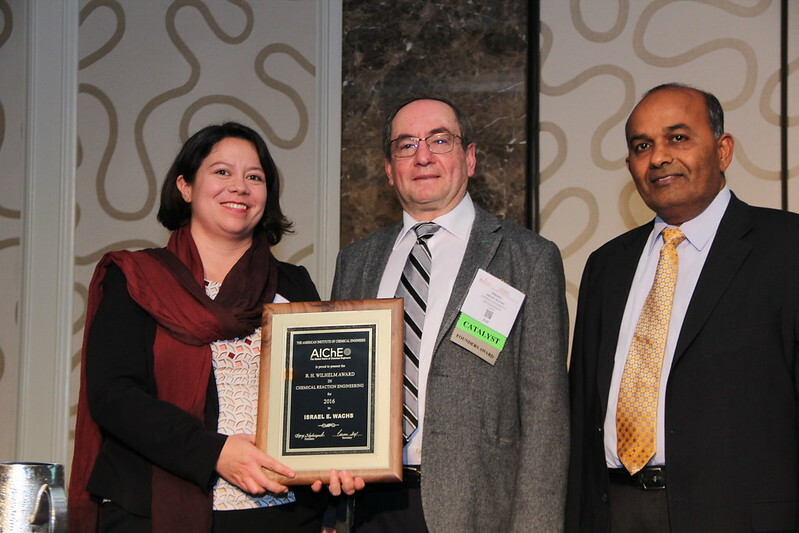 Stephanopoulos then introduced and thanked the Chair of AIChE's Awards Selection Subcommittee, Rachel Segalman of The University of California, Santa Barbara, to present this year's Institute Awards. After thanking the Awards Committee and Awards Solicitation Committee, Rachel present the Institute Awards. 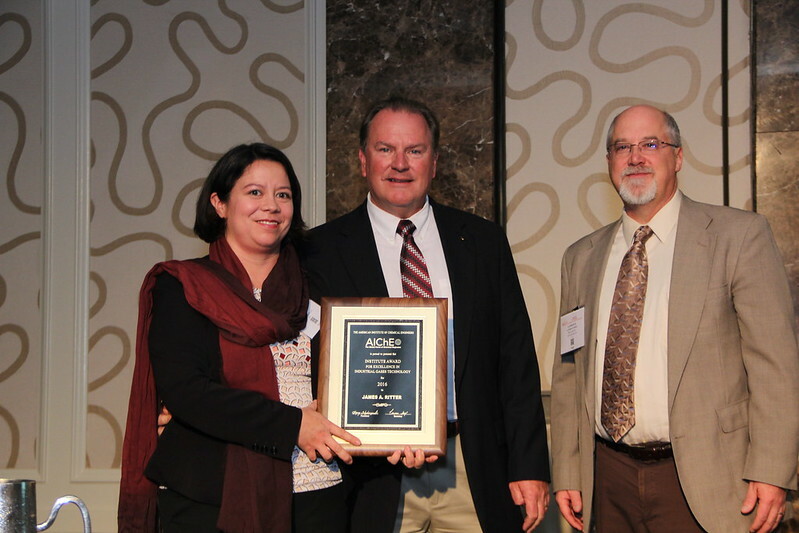 Sponsored by DuPont, The Allan P. Colburn Award is the second-oldest award of AIChE and was established in 1945. It is given to encourage excellence in publications by a younger member of the Institute. This year's award went to Dr. Jordan J. Green, associate professor at the Johns Hopkins University School of Medicine. Learn more about this award. Learn more about Dr. Jordan Green. Sponsored by the Alpha Chi Sigma Educational Foundation and established in 1966, this award is presented to Dr. Sharon C. Glotzer, the Cahn Distinguished University Professor of Engineering, and the Stuart W. Churchill Collegiate Professor of Chemical Engineering at the University of Michigan. Learn more about this award. Learn more about Dr. Glotzer. Sponsored by ExxonMobil Research & Engineering Company, this award recognizes significant new contributions to chemical reaction engineering. This year's recipient recipient is Dr. Israel E. Wachs, the G. Whitney Snyder Professor at Lehigh University. Learn more about this award. Learn more about Dr. Wachs. 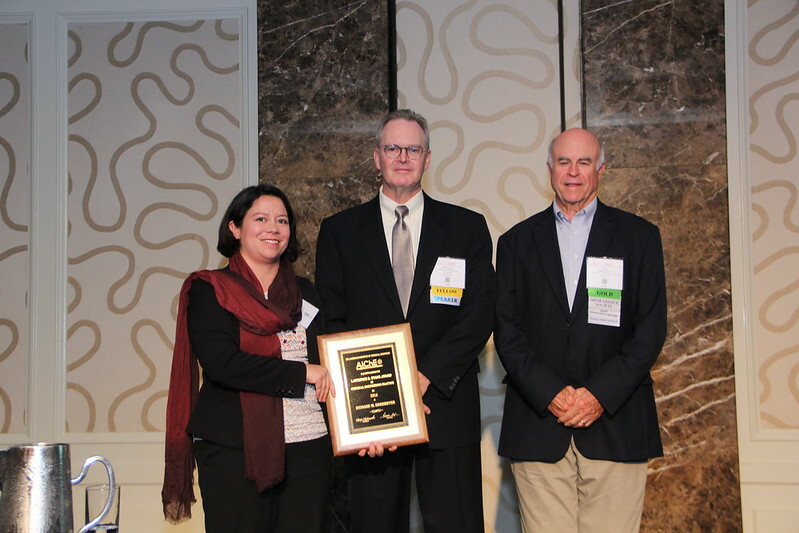 The Industrial Progress Award recognizes significant contributions to industrial practice by an individual working in industries served by chemical engineers. The selection of this early-career award is based on the impact of the contributions, the magnitude of the challenges involved, and innovation and creativity. 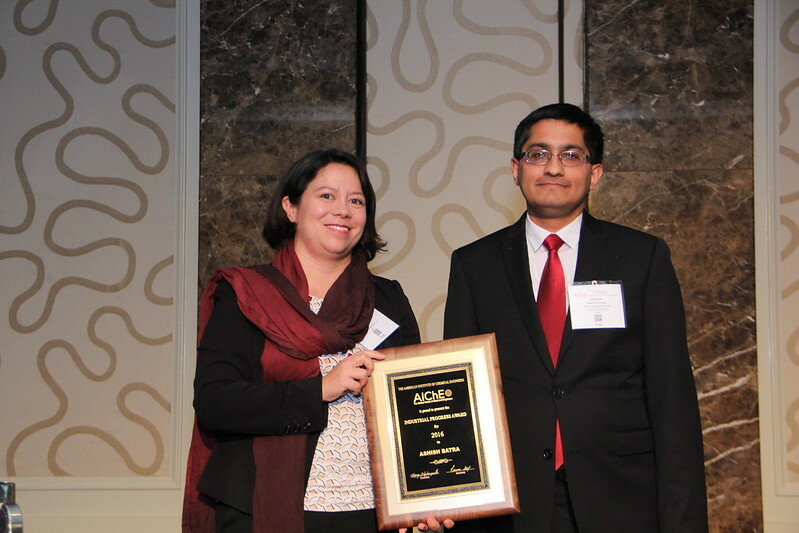 This year’s Industrial Progress Award is presented to Dr. Ashish Batra, Global Improvement Leader for Formulations and Packaging at Dow AgroSciences. Learn more about this award. Learn more about Dr. Batra. The Industry Leadership Award is presented to individuals or teams working in industries served by chemical engineers, and recognizes accomplishments in management; sales and marketing; public, community, and industrial relations; and public service. This year's recipient is Dr. James Trainham, an AIChE Fellow and the chief technology officer at JDC/Phosphate in Fort Meade, Florida. Learn more about this award. Learn more about Mr. Trainham. The Industrial Research and Development Award recognizes individuals or teams working in the industries served by chemical engineers, for innovation that has resulted in the commercial development of new products and/or new processes for making useful products. This year's award recipient is Dr. Mark B. Shiflett, an AIChE Fellow and Foundation Distinguished Professor at the University of Kansas. Learn more about this award. Learn more about Dr. Shiflett. Sponsored by Praxair, this award was established in 1993 and recognizes sustained excellence in contributing to the advancement of technology in the production, distribution, and application of industrial gases. The 23rd recipient of this award is Dr. James Ritter, an AIChE Fellow and the Carolina Distinguished Professor of Chemical Engineering at the University of South Carolina. Learn more about this award. Learn more about Dr. Ritter. 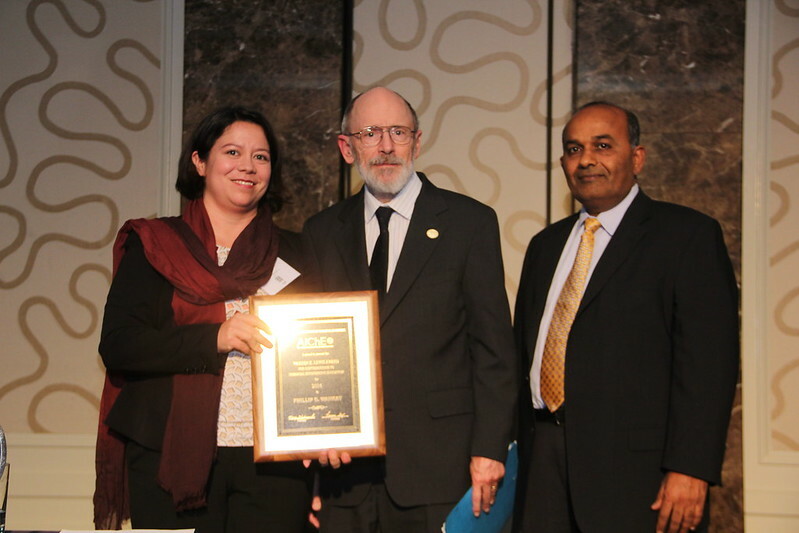 Sponsored by CACHE Corporation, this award recognizes outstanding chemical engineering contributions in the industrial practice of the profession. This year's recipient is Dr. Richard W. Korsmeyer, executive director for advanced external projects, technology, and innovation in pharmaceutical sciences at Pfizer. Learn more about this award. Learn more about Dr. Korsmeyer. 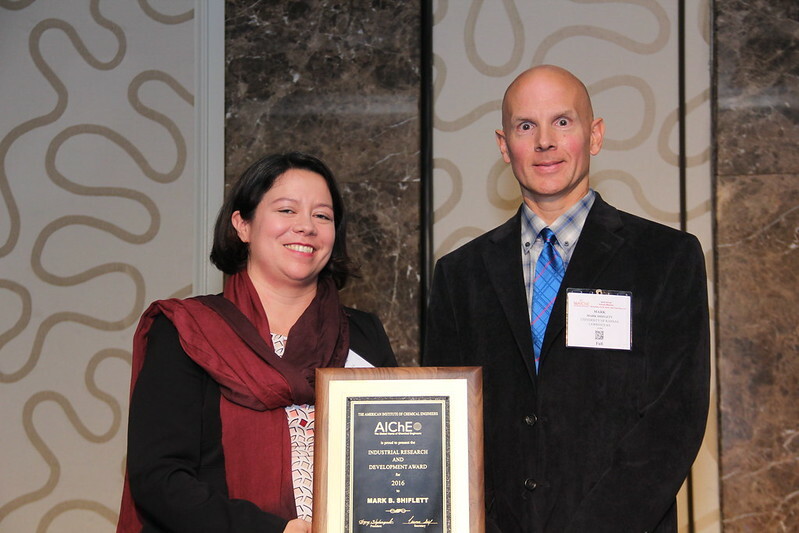 This award recognizes outstanding progress in chemical engineering by an AIChE member under the age of 45. This year's award is presented to Dr. Christopher Jones, the Love Family Professor and associate vice president for research at the Georgia Institute of Technology. Learn more about this award. Learn more about Dr. Jones. The Award for Service to Society recognizes outstanding contributions by a chemical engineer to community service and to the solution of socially oriented problems. The awardee’s contributions emphasize a concern for the common good, willingness to give time and comfort, and the ability to draw together varied resources to solve problems. 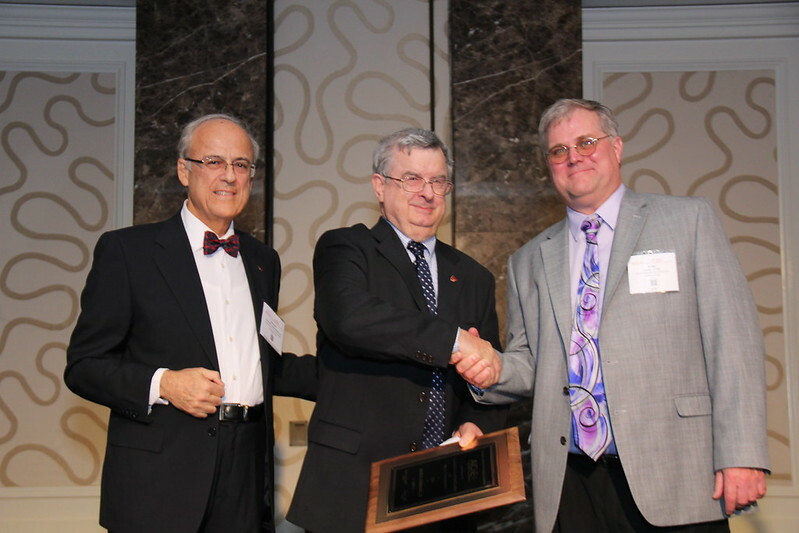 The 2016 award is presented to David M. Richman, an AIChE Fellow and a retired principal staff member at the U.S. Department of Energy’s Office of Energy Research. Mr. Richman was not able to attend the conference this week, but was represented tonight Peter Lederman, the past chair of the AIChE Foundation. Learn more about this award. Learn more about David Richman. Sponsored by ExxonMobil Research & Engineering Company, this award recognizes contributions to chemical engineering education. This year's winner is Dr. Phillip C. Wankat, an AIChE Fellow and the Clifton L. Lovell Professor of Chemical Engineering at Purdue University. Learn more about this award. Learn more about Dr. Wankat. 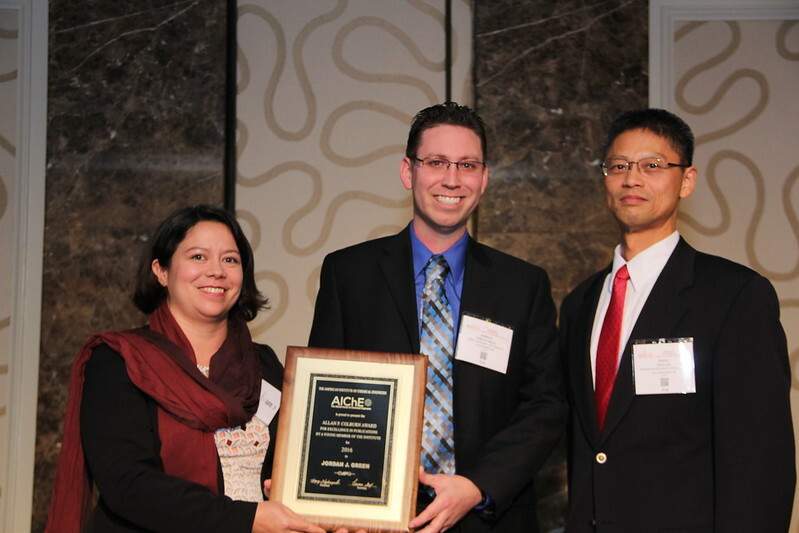 Sponsored by John Wiley & Sons, this award recognizes excellence in contributions to chemical engineering literature. This year the Walker Award winner is Dr. Glenn H. Fredrickson, Distinguished Professor and Mitsubishi Chemical Chair at the University of California, Santa Barbara. Learn more about this award. Learn more about Dr. Fredrickson. Rachel brought the ceremony to a close with congratulations to the recipients and encouragment for new nominations for next year. Feel free to congratulate our recipients in the comments section below or on Twitter using #AIChEAnnual.